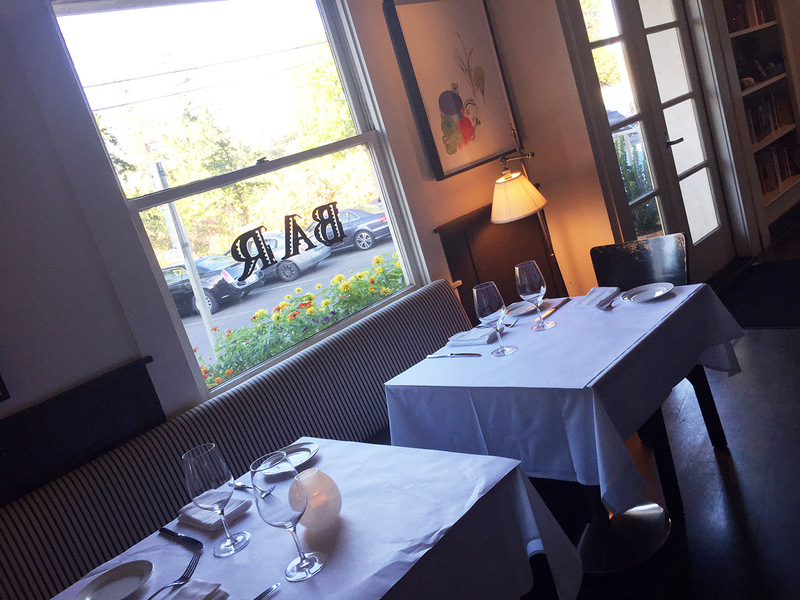 Cindy’s Backstreet Kitchen is one of my go to places in Saint Helena. The staff is friendly, they have a nice happy hour and its two blocks from my house. The locals tend to go more for the happy hour which goes from 4-6pm. Last night we were late so we just sat at the bar for regular dinner service. I always order my favorite dish, the duck burger. Cindy’s is known for for its Chinatown Duck Burger, which is Liberty Farms Duck, ground in-house, and served with shiitake mushrooms, a Chinese mustard and fries. I ordered mine paleo or protein style with a house salad instead of fries and I was still hungry which is why I felt compelled to look at the dessert menu. I perused the desserts, looking for something gluten free. Of course I am not an expert but I try to order the most gluten free item on the menu. I chose the Passion Fruit Creme Brûlée. It was topped with a mango, pineapple and mint relish. I asked the bartender what he had to pair with the dessert. I was hoping that he had something late harvest behind the bar. I could imagine how well the two would go together. Thankfully he pulled out a 2013 Honig Late Harvest Sauvignon Blanc Rutherford. It ran $22/glass so I tried a small sip before committing. 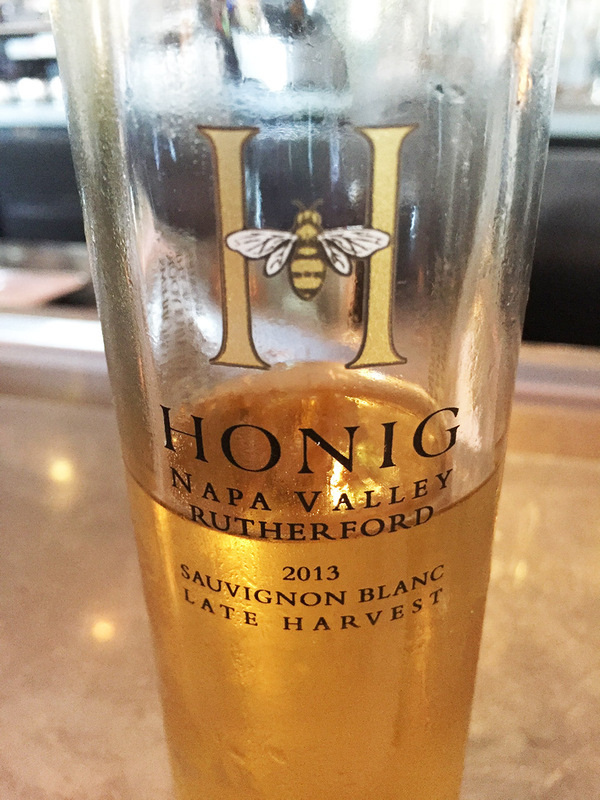 The Honig Late Harvest Sauvignon Blanc is a dessert/ fortified wine from Block One of their vineyard next to the Napa River. The sustainably farmed grapes are left on the vine longer to expose them to Botrytis cinerea, or noble rot. It causes the grapes to dehydrate, producing concentrated sweet fruit. It is then barrel aged in French oak for 8 months. I am not a dessert wine fan or a dessert fan. I usually only order it on my birthday or anniversary. I have 9 bottles of port in my cellar that will never be consumed. On the occasion that I do feel like a dessert wine, I lean towards the late harvest. The fruity, sometimes tropical notes appeal to me more than the richness of a port. The dessert came out and had a nice hard caramel top that cracked like glass, key to creme brûlée. The custard was a delicious passion fruit which reminded me of Liliko’i pie growing up (Passion fruit is called Liliko’i in Hawaii). It was very creamy and had a nice texture. The fresh mango, pineapple and mint relish complemented the sweetness of the creme brûlée. The Honig paired perfectly with dessert. It held up on its own with notes of apricot, honey and peach. The wine was sweet but seemed to have a shorter finish which made it balance well with the tropical flavors, not overpowering the dessert. I would recommend sharing this dessert. This pairing is ultra rich and I didn’t come close to finishing it. If you like a sweet ending to dinner, this would be a great option for you.